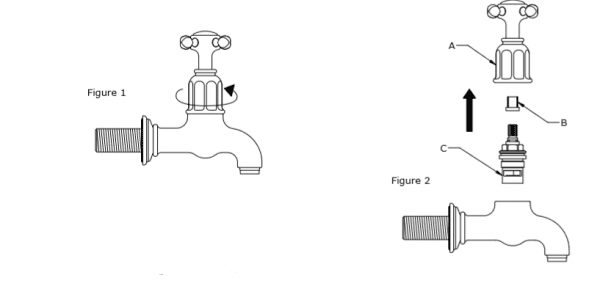 It should be an easy matter to change the Valve & Vernier Insert if you follow these simple instructions from Perrin and Rowe (Avillion) and refer to the diagrams below. 1) Turn off water supplies to tap. Place plug in waste to prevent loss of small pieces. 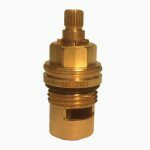 2) Remove Boss A by unscrewing in an anticlockwise direction from Valve C.
3) Unscrew Boss A and once free pull off. 4) The Vernier Insert B may be left inside Boss A or remain on Valve C. Remove and replace if damaged. 5) Please go to stage 8 if replacing the Vernier Insert B only. Note: Before removing the valve from the mixer, check that the replacement is the same. 6) Unscrew Valve C using a 17mm or adjustable spanner. Warning: Do not over tighten valve – this may cause damage to valve, body and mounting surface. 8) Slide Vernier Insert B onto Valve C.
9) Slide Boss A onto Vernier Insert B, just enough to see if it is correctly orientated. 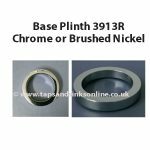 10) To get exact alignment on the tap it may be necessary to remove the Vernier Insert B and turn a few splines until correct alignmet can be achieved. 11) Boss A can now be screwed back over Valve C.
12) Your tap should now be ready for use, turn on supply and check carefully for any leaks. 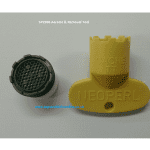 Here is the link to our Perrin and Rowe Spare Tap Parts. 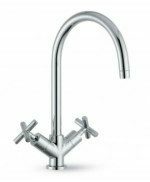 If your Tap is not listed, then email us sales@tapsandsinksonline.co.uk with a picture of your own Tap.